Last week this pregnant mama received one of the best packages she could ask for: 6 pints of Graeter’s ice cream. I love a quality, creamy ice cream and I’ve long had one brand at the top of my list (it was the only kind I would buy for myself). Before last week I had never tried Graeter’s and I must say, it’s definitely in the running for the most delicious ice cream I’ve ever tasted. The ice cream is creamy, the flavors are rich without being to sugary. One of my 10 year olds said she thinks the flavor names are the best part. No gimmicks, the flavors are straight-forward and you know exactly what you’re getting. If you’re ready to try it for yourself, there’s a good chance you’ll find a Graeter’s Neighborhood Store near you if you live in Ohio or Kentucky. If you’re like me and can’t make it to the neighborhood stores, you can find Graeter’s at grocery stores in the ice cream section of Publix, Kroger, Ingles, Fresh Market and more! 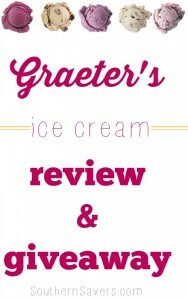 2 Southern Savers readers are going to win 6 pints of Graeter’s ice cream flavors. 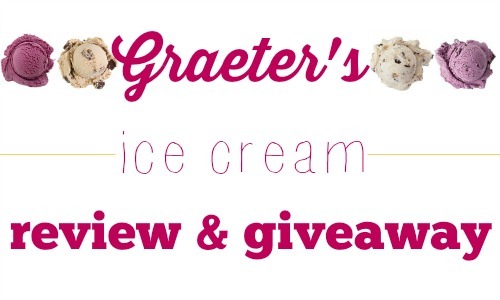 This giveaway is sponsored by Graeter’s, but all opinions are 100% my own.